Interview with Todor Spasov, Industrial Equipment Manager, Eltrak Bulgaria Ltd.
Mr. Spasov, what products are you going to showcase at the EE & RE show? Which companies do you represent at the local market? 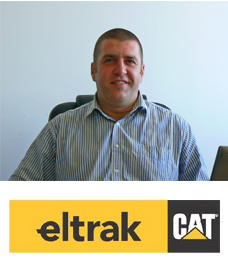 Eltrak Bulgaria Ltd. has been the official representative of the Caterpillar brand in Bulgaria for 23 years. The products we’re planning to showcase are the new highly efficient combined heat and power sets based on Caterpillar gas engines with power output ranging between 64-4500kW, running on low-calorific value gas (biogas, landfill gas, methane from sewerage water treatment plants etc.). We also have some new products in the field of hybrid technologies. Last year Caterpillar concluded strategic partnership agreements with a pair of companies using CdTl technology in the production of thin film solar panels with COP of up to 21.5%, as well as with the first ever manufacturer of zinc-air batteries, which are far cheaper than lithium-ion or lead-acid batteries. These batteries are designed primarily for storing energy from photovoltaic and wind power stations and for stabilizing power supply when sources are lacking. Furthermore customers visiting our display will get to see video presentations of our exhaust gas treatment systems, widely adopted in industrial equipment requiring Stage IV emission compliance. What prompted you to participate for a third consecutive year in the expo and who are your potential business partners and customers? The name of the exhibition „Energy Efficiency and Renewable Energy Exhibition“ clearly suggests that participating exhibitors are mostly suppliers of products, services and engineering in that particular industry. Caterpillar has placed energy efficiency at the core of its concept of innovative production and 2015 has probably been the richest of all years in that respect. A number of new models were created, yet to be launched. As brand representatives we are responsible for introducing our partners and customers to all that’s new in the line of production, so it’s our obligation to take part in Bulgaria’s only specialized exhibition in the field. Over the course of installing combined heat and power sets, we have picked out a number of companies, meeting our requirements regarding the execution of electrical and heating systems and performance of construction and assembly works. This however is not an obstacle for seeking new partners for implementing of other electrical engineering and heating and ventilation projects. It would be interesting to see what the rest of the exhibitors have to show. Hopefully we’ll come across some suppliers, whose equipment could complement our own products. So far we have delivered 5 cogeneration systems on Bulgarian soil with powers outputs ranging between 400 and 2000 kW, intended for vegetable greenhouse heating, as well as a number of biogas driven cogeneration sets. Our company also provides servicing for biogas power operations using Caterpillar gas generators. I’ll be delighted to meet anyone new, in addition to our existing customers and ongoing negotiations, so I’m using the occasion to invite your readers to visit our booth. How favourable have recent cogeneration trends been in terms of regulation and the New Programming Period, and what is the equipment range supplied by ELTRAK? Speaking of biogas installations, there is a significant potential for investment. Such energy sources, not yet been utilized, are available in Bulgaria. In terms of regulation, I think the legislating authorities have been active, but the counterpart, representing and reasoning the interest of the public and the business in the industry, has been missing. To make matters worse, throughout 2015 the Renewable Energy Sources Act was repeatedly amended every 2-3 months, causing such disturbance amidst investors that is seems unlikely they would have the assuredness and the desire to develop similar projects any time soon. Those recent tweaks in regulation have cost the investors some 6-7 million levs of irrecoverable losses that will prompt litigation against the Bulgarian government unless steps are made to improve the legal framework. The industry will only thrive if a long-term agreement is reached with regard to the effective and beneficial use of biogas resources and to fixing prices so that investors could effectively devise the return on their investment. You see, we’re talking about regulative and financial stability over a period of at least 7 or 8 years, that would allow completion of all those planning and investing activities involved. As for cogeneration systems running on natural gas, I have a lot of confidence, as the prices of electric power are expected to grow while the current price of natural gas is expected to remain stable over a foreseeable future period, making this combined heat and power generation technology fully competitive and expedient for investors and consumers alike. What are the advantages of Caterpillar cogeneration sets in terms of efficiency, cleanness and reliability? What would be the typical application of such equipment? As far as energy efficiency goes, combined heat and power generation makes use of nearly the entire energy potential of the fuel, converting it into usable energy. The last couple of years saw some significant improvement in the cost-performance ratio of Caterpillar equipment. New models in the 2000-2500kW range were put into production, with electrical power efficiency of 45% and thermal power efficiency of 43%. The term energy efficiency automatically implies cleanness, i.e. the higher the extent of burning the initial fuel, the less the pollutant emissions per unit of energy generated. Every year Caterpillar invests hugely into enhancing the burning process and reducing the amount of pollutant emissions in exhaust gases, using, where necessary, additional catalysts mounted in the exhaust pipes, minimizing the quantities of NOx and СО2 emitted. Reliability is measured in terms of equipment downtime and maintenance cost predictability. Ideally downtime should account for 5% of the total period of possession. Securing such levels of equipment availability requires careful scheduling of power consumption, repair shop and in-stock spare parts availability should a problem arise. Without having secured the above conditions, any talk of reliability is irrelevant. To completely meet our customers’ needs, we select for them the most appropriate warranty plans, covering all equipment parts against any defect of the materials as well as any labour and servicing costs in case of failure. We keep stock of all spare parts recommended by the manufacturer so that we are always prepared to supply and install any such part shortly if necessary. We’re using special software to monitor equipment performance in real time. We conduct training courses on yearly basis for our service center personnel and pay for renewing their license to perform maintenance on the cogeneration equipment. Our combined heat and power sets are suitable for any application requiring cheap, clean and autonomous power.